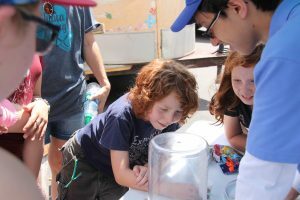 The best part or my job is going to our events and watching the wonder in the eyes of the kids as they play with science and have that “aha!” moment. It’s sometimes the simplest things like stomp rockets that get their attention and inspire them to think about the world in a different way. Thought I’d share some of what we’ve been up to this summer! Mingling among the people at our events is very enlightening — and very reaffirming. So many people continually comment about how great it is that we’re doing what we’re doing, and how much they appreciate our work and our events. It’s kind of an ASC love fest. If you find yourself free on a Wednesday evening, you should stop by the Physics for Kids BBQs. Our staff and Intern Educators have really done a great job of getting the BBQ logistics down to a science, as it were. They run like clockwork. Come and mingle. The parents and grandparents sit on the benches and chat, and it’s interesting to hear their stories. On the 28th we’ll be back at the Aspen Saturday Market. Regarding the Intern Educators, the program has grown a lot both in terms of quantity (record 9 this year) and quality. Three are returning for their second year. One, Will for his third. We promoted Will to Program Assistant and he does a lot of the logistical legwork and organizing for events, allowing Keith to focus on bigger-picture things, like creating new activities and plan for upcoming events. We are still looking for sponsors for the IEs. If you are interested in sponsoring an IE for $1,500 for the year, we would appreciate your support. We can’t deliver our programs without the help of the IEs. I was talking to a grandfather the other night at a Physics for Kids BBQ. He was there with his soon-to-be kindergartener grandson (although based on his knowledge and confidence I would have guessed more like second grade). Grandpa visits in the summer, the grandson lives here. The grandson is a science enthusiast. His grandfather takes him to all of our events. He said last year they didn’t miss one BBQ. The grandfather has to leave next week, and he’s not sure that the parents will be able to get the kid to the BBQ, but he is going to make sure that they take him to the Summer Science Fair on August 5th. The fair will be at Pitkin County Library (PCL) and Galena Plaza. We are excited to partner with PCL on this signature event. This is an ideal, central location, with the parking garage right there, bathrooms, plus the adjoining indoor community room with 20-foot wide sliding doors that open directly onto the park. PCL has become a great partner. We did the hugely successful Great American Eclipse there last year in this same space (where we handed out over 1200 pairs of eclipse glasses, with a line that at 10:00 am went out the east door by Galena plaza, west on the alley to Main, north on Main and then east on Rio Grande to the entrance to the parking garage). We did Science Rocks! with them in July, with a bunch of hands-on activities for several dozen youngsters. PCL loves our programming because it’s educational and brings people into the library. July 30, we have our showing of AlphaGO at the library, a very interesting documentary on the first AI machine to beat a master champion Go player. This event is free. Cool Science returns for the second year. 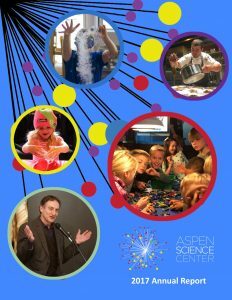 This Colorado Springs-based organization is much like the Aspen Science Center in terms of mission and their activities. Pinhead Institute, long-time attendee, returns from Telluride. They are proudly “a science center without walls,” just like ASC (for now!). Ball Aerospace continues their long-time attendance. The usually bring their thermal imaging camera. Last year they brought a full-scale mock-up of one of the lens segments of the James Webb Telescope, which was really cool. Caroline Hanson who runs Robo Yetis, the Aspen High School Robotics program, will return after a several-year hiatus. She always has great stuff! Ice Age Discovery will be back. Last year they had a sandbox full of sawdust with buried faux bones that kids could excavate, while wearing their little Ice Age hardhats. The library has a maker space, and some cubic robots that can be connected together to do things, as well as other remote-control toys which were a big hit last year. And the centerpiece will be MESO, the Mobile Earth and Space Observatory. They have a 14” optical scope, solar scope, and exhibits about environmentalism and planet habitability. At the BBQ, I overheard Keith talking to a grandmother. She said that her grandkids were excited for the Summer Science Fair because they love going when they visit each year. Then she said that they had scheduled their visit to Aspen specifically so that they could go to the Science Fair. If you don’t think that what we do inspires kids, think again. Perhaps not surprisingly I find that it’s the grandparents that are the most ardent supporters. By the way, we’ve been holding our monthly Senior Technology Workshops this summer again. The IEs enjoy helping seniors navigate email, text, Facebook, the web, photo editing, etc. The seniors and the IEs both love it, and it’s so easy for us to do. 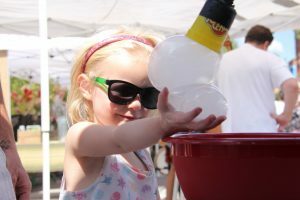 At the market, IE Ollie was demonstrating the vacuum chamber which led to a discussion of the relation of the boiling temperature of water to elevation and we queried the crowd of six-year-old-ish kids to see if they knew what the boiling temperature of water was. Not too surprisingly, they didn’t know, so we asked the handful of parents and grandparents standing behind them. One of the five knew that the nominal boiling temperature of water was 212 degrees. Our work is important. 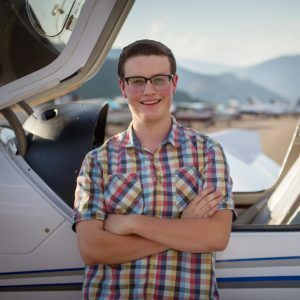 Ollie is a Senior at Park High School in Baltimore but he and his mom are in Aspen every summer. This is his second summer. Ollie is particularly interested in math and computers. Last year he observed to Keith that we didn’t have any math stuff so he took it upon himself to create an entire table of math puzzles and activities at last year’s Science Fair. We still use them at BBQs. This year he’s declared that we don’t have enough computer programming. I’m sure we will soon! You can read more about our IEs in our Annual Report. Imagine my surprise when vacationing in Aspen last week, to pick up the Aspen Times Weekly & seeing my son, Alex, on the front page! The shocker, however, was that the photo was from approximately 16 years ago! We spent every summer in Aspen when my son was growing up. One of his favorite weekly activities was attending “Physics for Kids”. I remember this LEGO construction because Alex, and his friend Ian, were extremely proud of their unique creation. Just thought you’d like to know that Alex received his bachelor of science in electrical engineering with honors from MIT in 2016, his Masters Eng. in 2018 & will begin working on his Ph.D. @ MIT this fall. Alex always loved math & science & is pursuing a career as a biomedical electrical engineer. Can’t help but think that his summers in Aspen contributed to his passion for scientific discovery & building innovative devices. Suzan sent along a picture of the cover of the July 5 Aspen Times Weekly, showing her son on the cover and in the article. The cover article was “The Great Eight” about how to enjoy Aspen without spending a lot of money. Our Physics for Kids BBQs were number two. On a different front, our Preschool Education Program (PEP) wrapped up another successful year this spring. Our Educational Programs Manager, Maya Hunt, has done a great job of building this unique program to teach STEM to preschoolers. That’s the mid-summer update. I hope that if you are in town you can stop by our events.